Week 3 begins with another book from the shelf! I think I bought this one from the Yorkshire sculpture Park online shop when Rob Ryan had an exhibition there. I'm lucky enough to have a signed copy....Like so many of my beautiful books I remember having a quick look at it when I received it but not actually reading it! 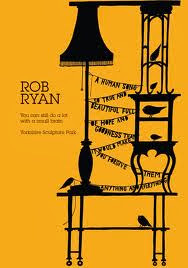 I enjoy the work of Rob Ryan immensely & follow his blog. You can get hold of a copy of 'You Can Still Do A Lot With A Small Brain' here..... I'm sure this particular book will inspire me to get my sketchbook out. The last one on Cornwall did make me appreciate the coast & encouraged a couple of little beach walks.